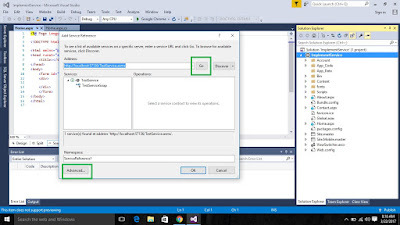 In this post we will learn how to consume a Web Service in asp.net using Visual Studio 2015. How to add service reference and and also detail about the basic terms used in Service like end points etc. 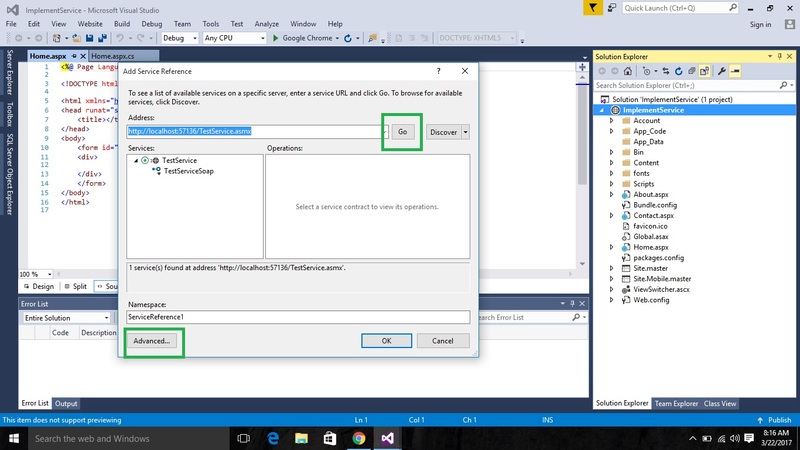 VS 2015, VS 2012, VS 2013 doesn't allows you to add a service reference directly from references . 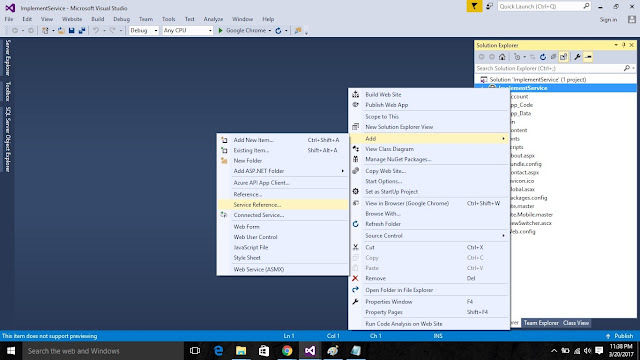 VS 2015 has some new advance features. In previous post we learned how to create a Web Service now we learn how to run this service with our application. Just like service creation , service consumption also done in 5 simple steps. 1. Add a New WebSite, give a suitable name to it (in my example application name is ImplementService ) and click OK.
3. Run your service project which you created earlier and copy the service URL and click on Go. Your Web Method should display in left side panel. 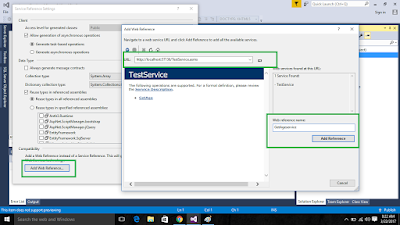 If you did not create service yet please read this post first Create Web Service In Asp.Net Using VS 2015 . 4. Click on Advance and then click on Add Web Reference and paste your service URL here and press enter. Your service methods displayed in front of you .Change service reference name ,here i used GetAgeService and click on Add reference. 5. Your service reference added successfully now just create a simple aspx WebForm in your application and write code for getting output from service method call. <%@ Page Language="C#" AutoEventWireup="true" CodeFile="Home.aspx.cs"
<asp:Button ID="btnGetAge" runat="server" Text="Get Age"
In the above code i added GetAgeService on namespace, which is service refrence name given earlier at the time of Add Reference. On the button click first we need to create a service object . 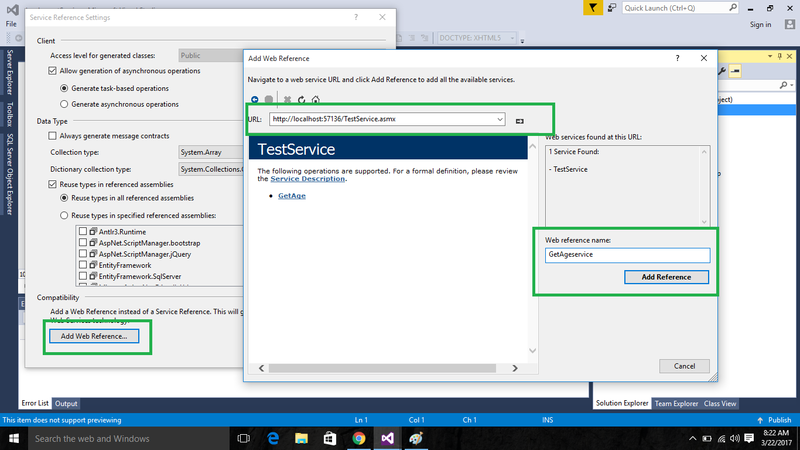 By adding namespace GetAgeService , TestService is accessible.in project. Create the object of service and access the web method . Run the Project and Enter DOB in DD/MM/YYYY format in TextBox and click on GetAge button. And you get the Age in output based upon entered DOB. Hope this post will be very helpful for you. If you have any query related web services please let comment down below.